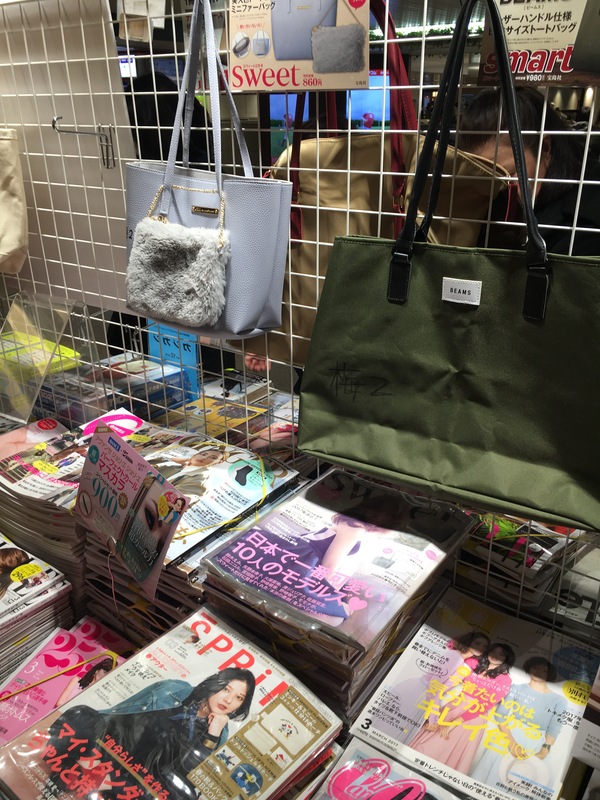 If you have ever held a Japanese women’s magazine in hands at one of the many book stores in Japan, you might have noticed how big some of them are. But it probably didn’t take long for you to figure out, why. Women’s magazines try to get your attention not only by providing the best content, which, in many cases is very similar to other magazines. They try to sway you by offering the best goodie as well. Every month you can choose between bags, pouches, make-up or even little books. Of course the quality of a bag that can be crammed inside a little carton box into a magazine might not be the best, but often they are surprisingly sturdy. Collaborations with brands, such as Disney, Anna Sui, and others, provide another incentive. Of course many have their favorites and will stick to the magazine no matter what, but if you are only looking for something to read on the train, in a café or to bring home as a reminder of your time in Japan, you will probably choose the one with the goodie most appealing to you. Have you noticed the magazine goodies in Japan? Have you ever bought a magazine just because of the goodie inside? Let me know in the comments. I want to a lot about Japan!